Last week saw IBP attend the 6th annual, Team Networking conference at Whittlebury Hall Hotel in Northamptonshire. Where the resonating engines of Silverstone melded with the sounds of the best and brightest recruiters and recruitment suppliers from up and down the country, as they gathered to share knowledge and experiences. As is the case with these types of events, there is more to be seen than can ever be seen, so unfortunately, only a small selection of its offerings were able to be viewed. After looking around the suppliers and catching up with familiar faces, the team attended the first talk, which was given by Warren Kemp, from Recruitment Matters International, on ‘How and why money can grow on trees.’ An interesting prospect, as, from a young age we have been ingrained with the belief that money simply does not grow on trees. However, Warren spoke about how, by treating your business like an orchard, you can grow the right kind of fruit, year after year. Next, Craig and Tania made their way over to the Monza lounge to listen to Simon Whitehead speak on GDPR in relation to recruiters. In this seminar, Simon spoke about how recruiters can ensure they are GDPR compliant by May of this year, when the new data protection law comes in to replace the seemingly archaic one from 1998. The focus here was all about how you are responsible for the journey of the data, both in relation to candidates and clients alike. Following lunch, they attended a talk by Jeremy Snell on powerful persuasion techniques. Something we can all agree is one of the most important attributes for a recruiter to learn and master. As we all know, every point in recruitment is persuasion, from convincing a client to work with you, to persuading the candidate to apply. After Jeremy’s talk came Matt Gullivan’s seminar on how ‘Nothing happens until a sale takes place,’ and how, whether you like it or not, every employee is in some way in a role where they can affect sales, for better or for worse, and how sales isn’t a dirty word, but vital to every business. 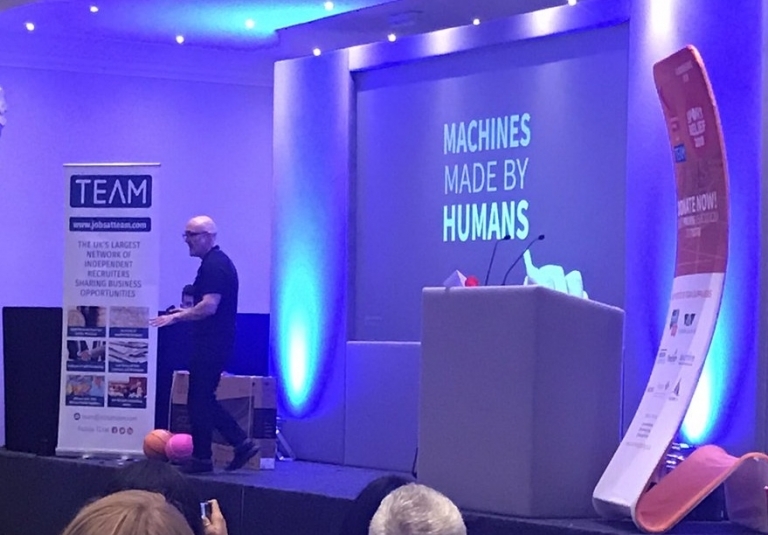 Lastly, the Team joined the other attendees in the Brooklands suite to hear Key Note speaker, Dave ‘Google’ Hazelhurst give his talk, ‘Getting Goosebumps’ about changing the thought process on marketing within Recruitment, which runs in a similar vein to a previous blog of IBP’s ‘Tech versus the Human Touch,’ and how, the more high tech we become, the more vital it is that we remember to engage with each other, as our industry is all about people. Managing Director, Craig Roberts commented, “At IBP furthering our development and knowledge base is paramount to us improving year on year, and the best way to gain this education in any industry is directly from thought leaders. TEAM’s conference was a fantastic opportunity for us to gain an insight on topics from some of the world’s leading recruiters, so we can continue to grow and offer a better service”.